Kyolic® Aged Garlic - Immune Formula 103, 100 capsules (Wakanuga) - Penn Herb Co. Ltd. This combination of vitamins, mushrooms and herbs helps to support healthy immune function. It includes Shiitake, Maitake, Poria Cocos, Reishi and Agaricus mushrooms, plus Astragalus, Oregano and Olive Leaf extracts. 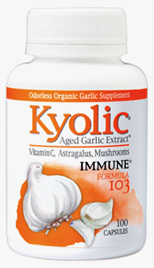 KYOLIC® Aged Garlic Extract™ begins with 100% organically grown garlic bulbs. They are then aged to perfection in a unique extraction process to eliminate odor and create beneficial compounds found only in Kyolic. Free of: sodium, yeast, dairy, preservatives, sugar, gluten, artificial colors or flavors.